What is the most traditional American cuisine? Is it the fast-food movement that grew out of the Prohibition Era, when it shut down the classic New York restaurants and ceded real estate to greasy spoons and diners? Growing up in Singapore, the American food I was exposed to was the McDonald’s in the Eastern town centre of Bedok North. That’s a strong candidate, certainly America’s most visible export. France, land of the baguette, is actually the second-most profitable country for McDonald’s worldwide! But tradition goes deeper than the 20th century. Democratic – every man, woman, and child could have an opinion and variation. 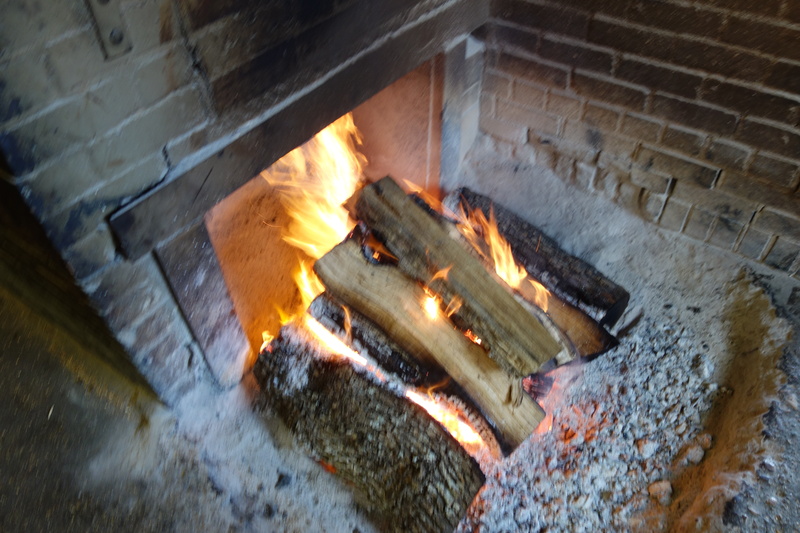 History – In North Carolina in the 1660s, pigs started to be roasted. Vinegar was used as a bactericide, and peppers a source of Vitamin C to prevent scurvy. Slow cooking at low temperatures made it less likely the bbq rack would go up in flames. 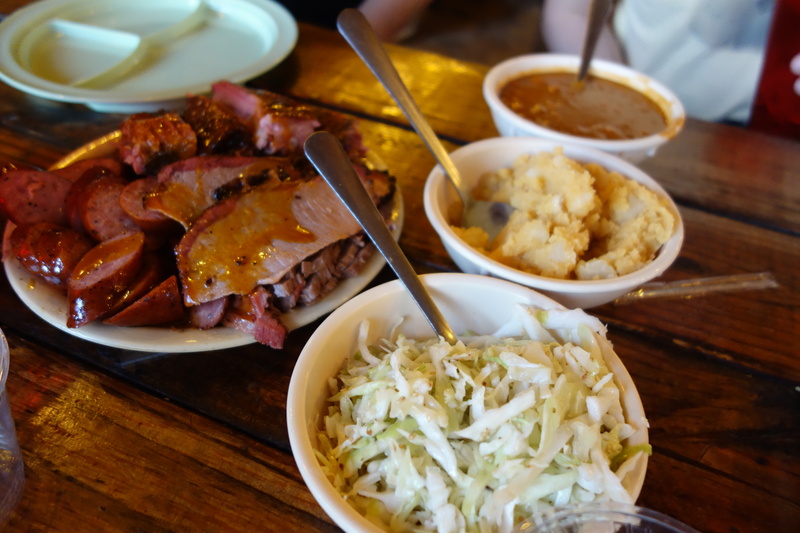 In Texas, bbq was used as a means to feed large groups of people. 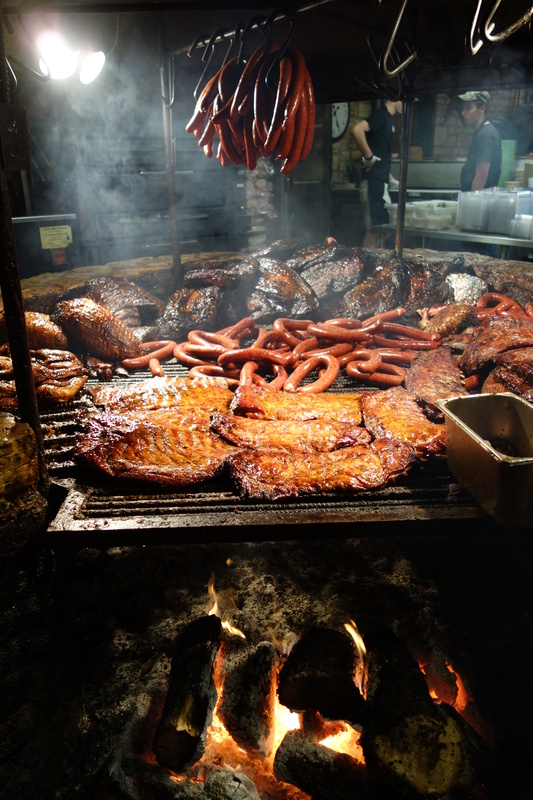 A Sam Houston political rally from 1860 was called the Great American Barbecue. – An Economist Gets Lunch. Widespread across America – The diverse “centres of excellence” include Memphis, Texas, North Carolina, and Kansas. In recent years, smoke permits have allowed a rash of BBQ restaurants to arise in NYC. Democratic – you bet everyone has their own recipe for rub, and smoking times. In An Economist Gets Lunch, Tyler Cowen argues that big cities have traditionally been inimical to barbecue because of the fire hazard of a slow-burning open pit. With better technology, I think such risks can be mitigated. 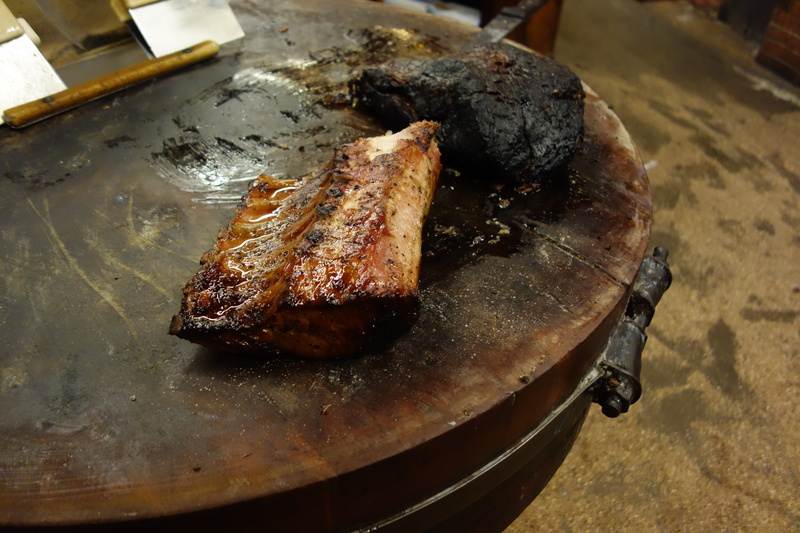 Burnt Ends in Singapore (of the Spanish bbq tradition), for instance, has in a small space put a oven that reaches 850 degrees centigrade. Brisket is a popular cut in Texas, and represents breast/lower chest meat. Only long-hours over the pits can break down the collagen tissues in brisket enough for it to be delicious. The brisket is split into two parts, the flat end and the point end. The flat end represents everything that you dislike about chicken breast meat – tough, stringy, relatively flavourless. 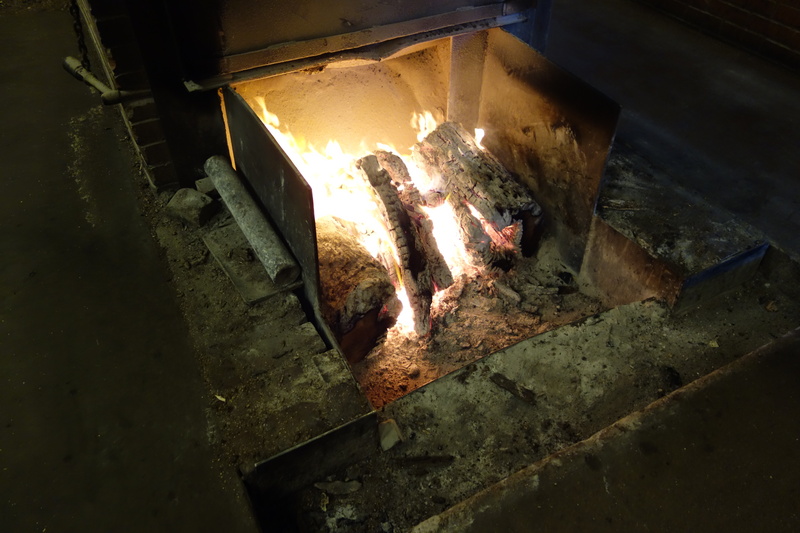 The point end endures long hours over fire, charring its exterior, giving it the sobriquet – Burnt Ends. This normally tough cut of meat, due to the collagen fibers that make up the significant connective tissue in the cut, is tenderized when the collagen gelatinizes, resulting in more tender brisket. The fat cap often left attached to the brisket helps to keep the meat from drying during the prolonged cooking necessary to break down the connective tissue in the meat. Water is necessary for the conversion of collagen to gelatin. 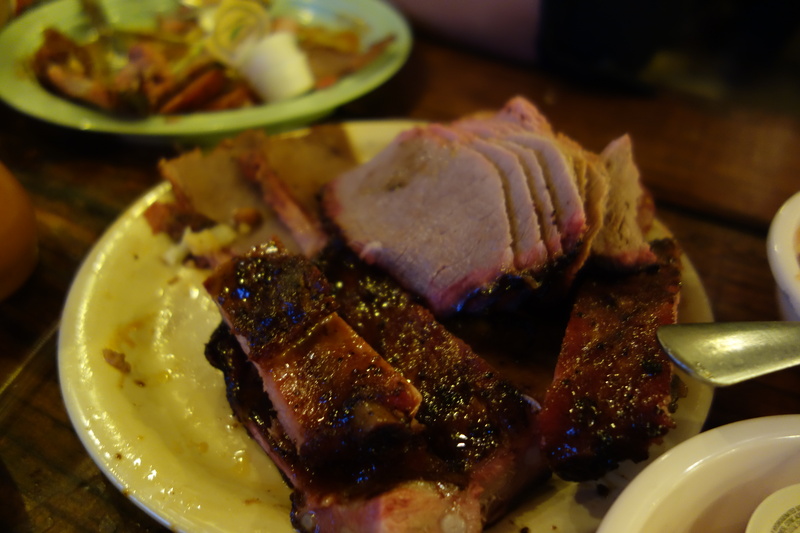 – Wikipedia on the science of BBQ. 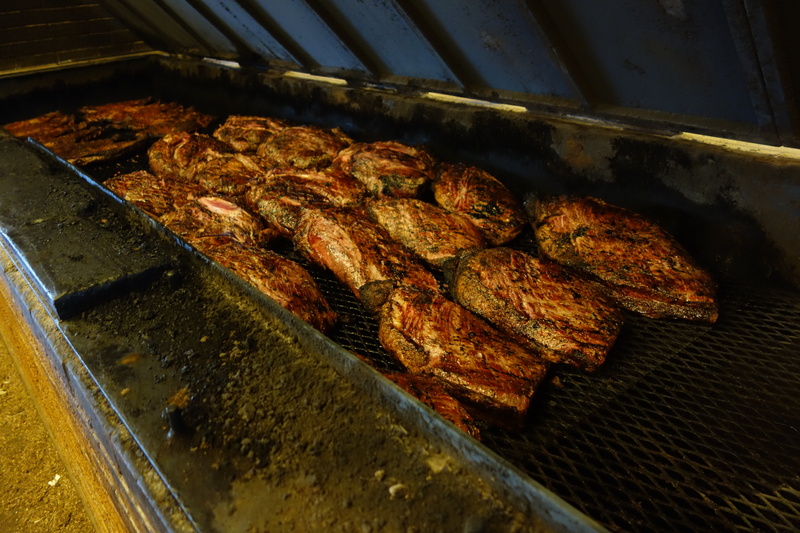 In March, my friend C and I, went to Texas to sample the famed BBQ pits of Texas. These being the most famous standards by which American barbecue is judged, would also serve as to calibrate our standards for barbecue. Burnt ends were flavourful and succulent. My fingers ended up as well-seasoned as the barbecue, and I found myself unable to make notes on my iPad about the meat candy we tried, and … I also forgot to after the dinner. According to my highly unreliable 8-month-after-the-fact impressions, I think these were among the best burnt ends we tried on the trip. Not pictured are beef ribs, but they were also very good. 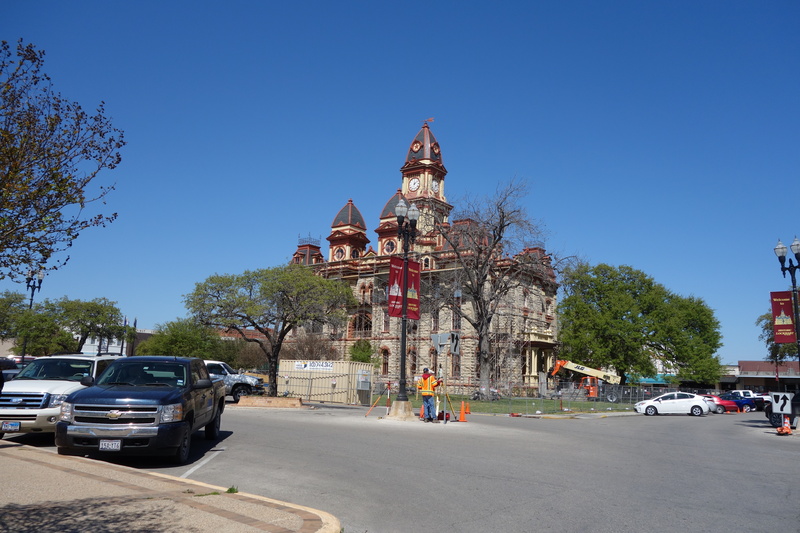 The place attracts a lot of tourists, even though it though it is a 30 minute drive from Austin TX proper. 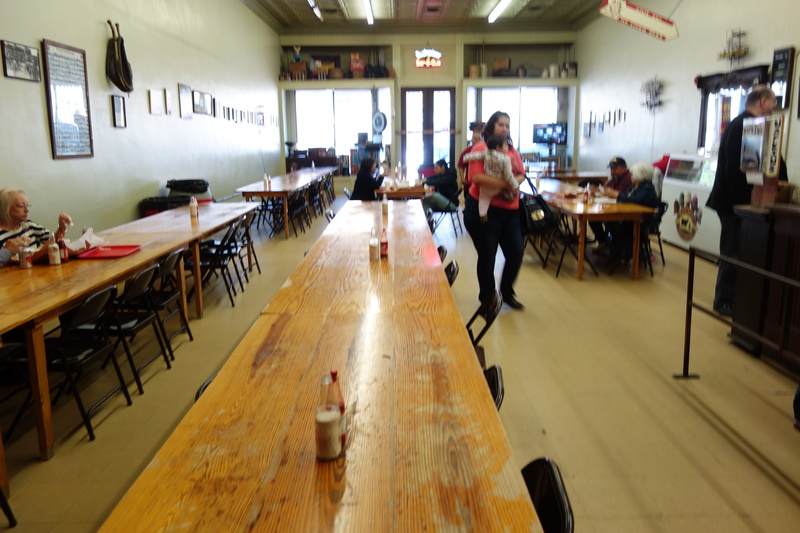 Food is served in a large enclosed mess hall, and many order a last side of brisket and ribs to pack away for the next week. 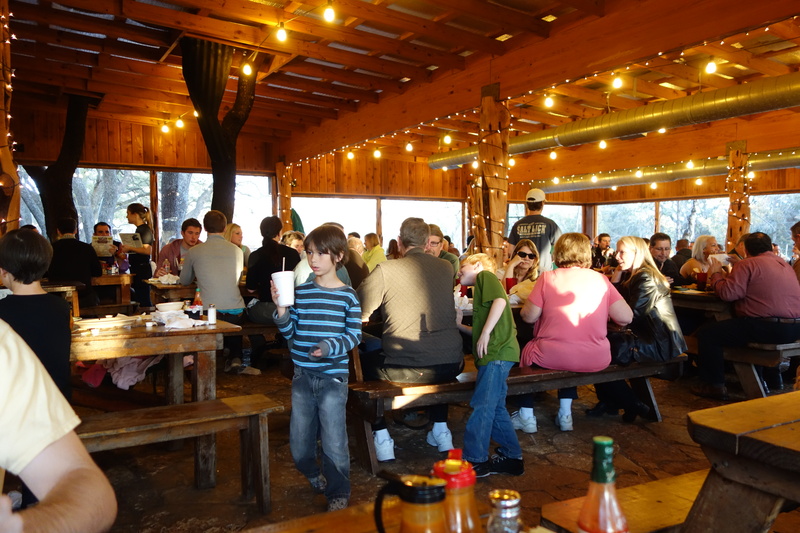 A barbecue aficionado’s thoughts on the Salt Lick. 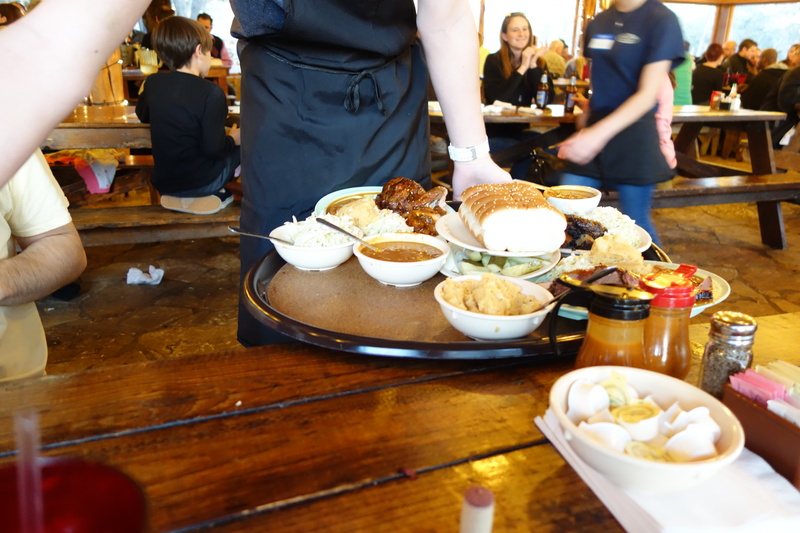 From there, we moved on the Lockhart, the Barbecue Capital of America. 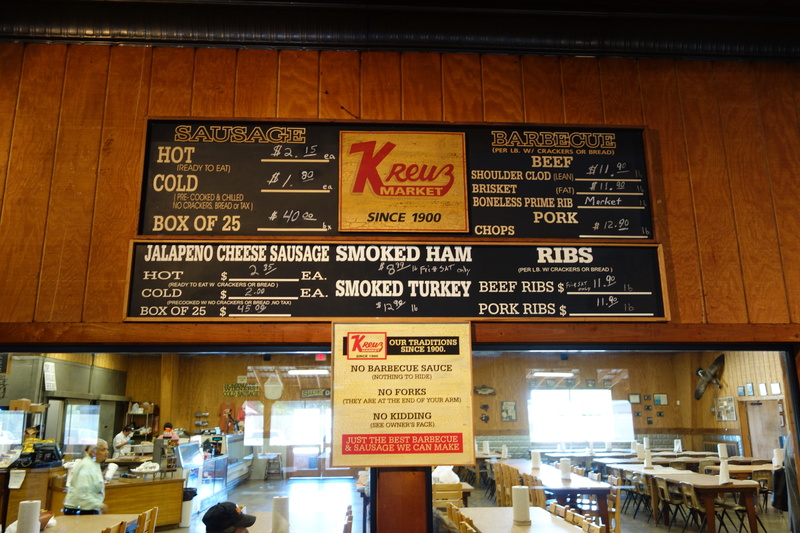 Kreuz Market is located in Lockhart, a delightfully quaint town. 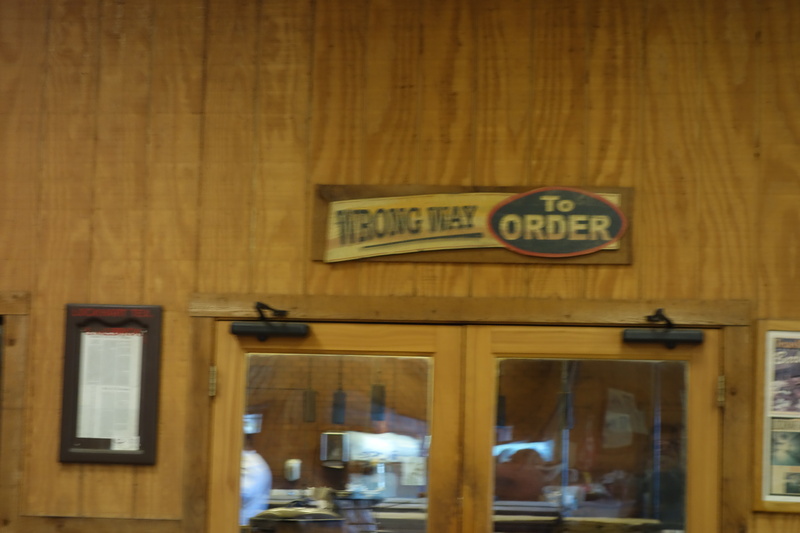 It contains three major barbecue shops (Kreuz, Smitty’s, Black), all regarded by some people some of the time as the best BBQ places in America. Strapped somewhat for time before we headed to San Antonio, we decided to hit up Kreuz and Smitty’s. 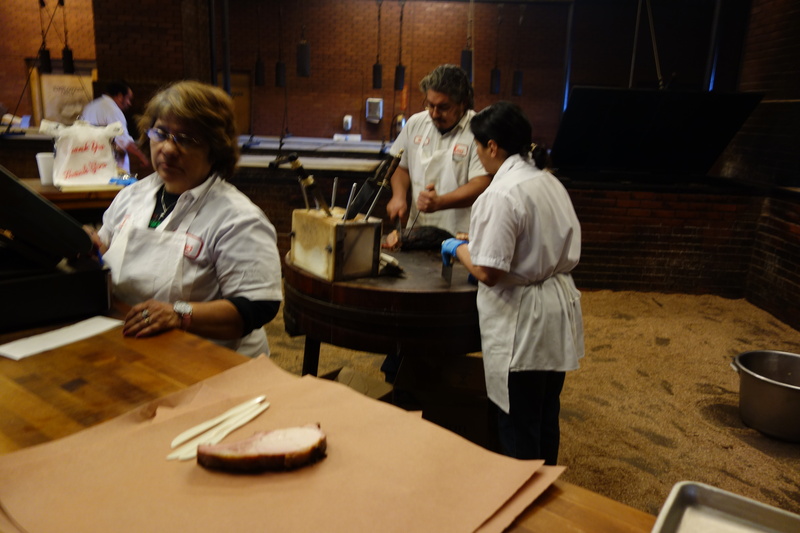 Kreuz was started by a German family, quite common in West Texas, which is home to a rapidly declining dialect called Texas-Deutsch. The best thing here was the Jalapeno cheese sausage, oozing with an addictive spicy, cheesy flavour. It was the first thing to go from our plates. The brisket was stringier than at The Salt Lick. 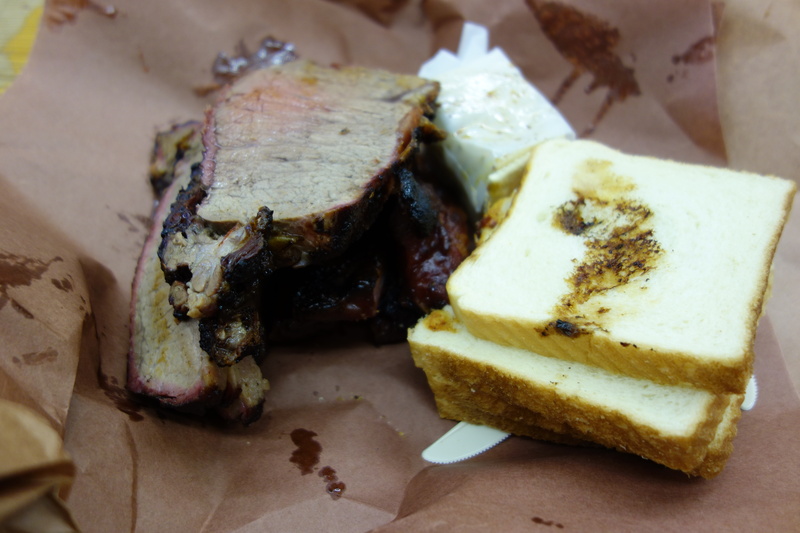 No forks are given at Kreuz – one toughs it out with two knives. The brisket was very flavorful, but tough. 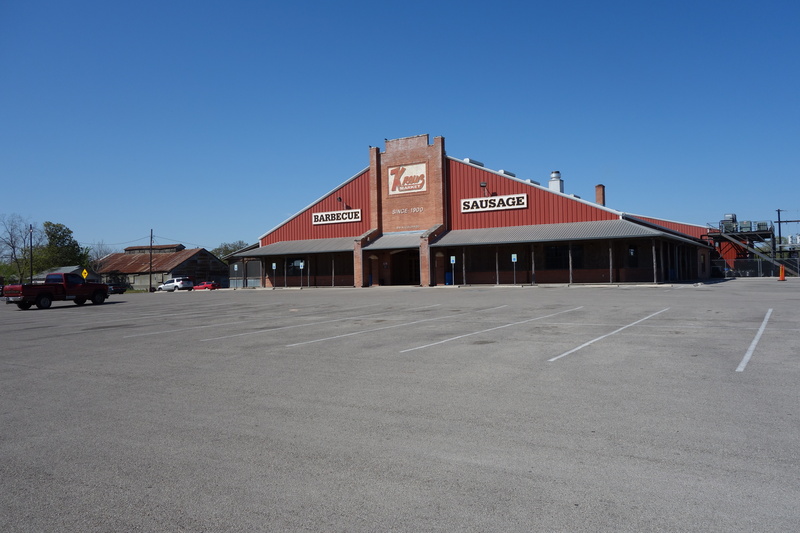 Smitty’s Market operates out of the old premises of Kreuz Market, which were vacated in 1999. 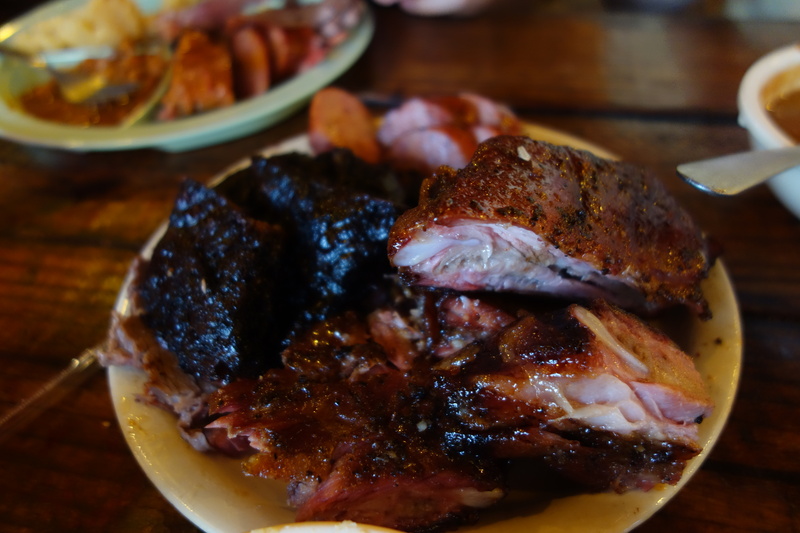 We noticed that the barbecue was always served with white bread and saltine crackers in Lockhart. The charred part of the beef ribs had an admirably crackly crust that tasted of salt and pepper. Even though we were quite full from having had Kreuz about an hour earlier, we finished the beef ribs and pork ribs with enough to spare. The brisket was a bit tough and stringy. Also of some childhood nostalgia was coleslaw, which was identical with that served at KFC. KFC-type Coleslaw is one of my many weaknesses, and I had seconds. Driving through Texas also made me aware of how reliant Americans are on their cars for going anywhere interesting. Commuter rail transportation in Texas is almost non-existent, and we had to hightail more than 15 hours of driving to get from Austin->Driftwood->Lockhart->San Antonio->Houston->New Orleans. This is why I am so excited for the Google self-driving car. Think of all the time that will be liberated for drivers! (more to fritter away, says the cynic, but the human benefit is almost incalculable. My review of Burnt Ends, spanish barbecue in Singapore.